If I am an expert skier, turns out I am a bunny slope biker. Still, cycling keeps my quads in shape as I count the days till snow season. Many of my ski buds go mountain biking at ski areas for a summer fall line fix. Imagine my surprise when I witnessed their full suspension bikes and body armor for a sunny bike ride at Sunday River. Another shocker was how steep a green circle ski trail feels on a bike. Without the layer of smoothly groomed snow, my favorite trails are grassy, gravelly, peppered with rocks and boulders . Three Mile Trail, a super mellow ski run, feels much steeper on two tires than my skis. There was no way I was going to attempt black diamond Grease Monkey – a specialty bike trail with bridges and berms. Sunday River Mountain Bike Park is a downhill playground with 30 trails that stretch out over North Peak and South Ridge. Sunday River’s Chondola, a hybrid of gondolas and six pack chairs, provides high-speed lift service to every level of riding from low angle dirt-work roads, to more advanced single tracks with technical jumps, wooden bridges and steep pitches (I believe this is where the body armor comes into play). I quickly discovered I prefer my steep descents on skis versus squirrely bike tires. Paved and dirt roads are more my speed. I found beautiful riding on Monkey Brook and Sunday River Road along babbling streams out to Artists’ Covered Bridge, by beautiful birch groves to sparkling swimming holes like Frenchman’s Hole surrounded by big granite boulders. Sunday River’s Bike Park is open 10am to 4pm, Friday – Sunday June 21 – October 14, plus July 4, Labor and Columbus Day. Peak Foliage and the North American Wife Carrying Championships on Columbus Weekend provide even more entertainment at Sunday River in the fall. 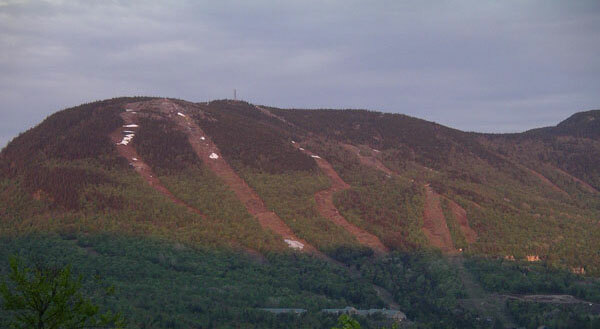 Sunday River’s mtn bike park is $29 a day for lift and trail access, $10 for trails only – no sweet ride up the Chondola. Sunday River also offers bike and bed packages starting at $49 a night. If you don’t BYOBike – Sunday River Sports rents bikes at the South Ridge Lodge.